Ethereum is trying to recover after a selloff on Thu, Dec 6, trading at around $104.02, reports Dmitriy Gurkovskiy, Chief Analyst at RoboForex. 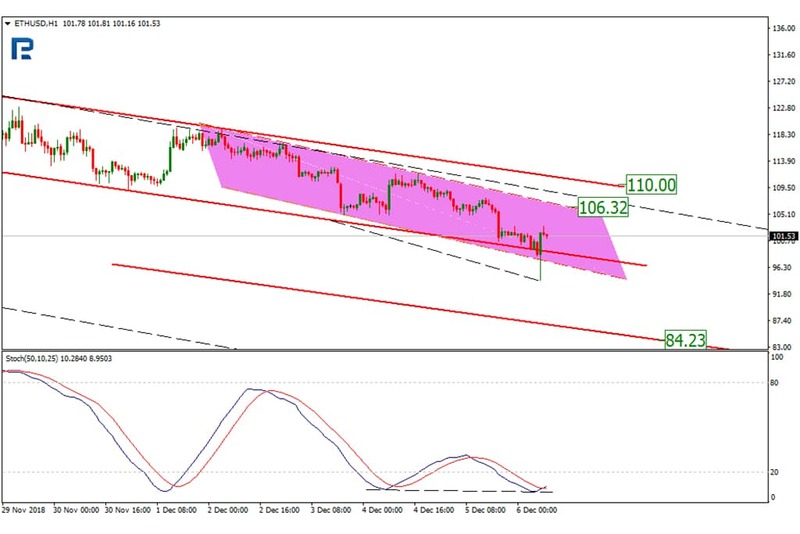 On H1, the price has hit the latest local support at $98.04, which could be a signal to an uptrend. In the short term, the Stochastic has been converging, so a pullback and then a return to the previous channel is quite possible. This way, the price may well correct to $106.32 and $110.00. In the midterm, meanwhile, a downtrend is possible, with the target at the projection support near $84.93. The current Ether price is not just as per its blockchain value, says Joseph Lubin, one the Ethereum creators. According to him, the network is still being developed, and the changes the market and ETH in particular is experiencing are very much effective. The number of users is growing, especially those from Asia. Besides, the Ethereum ecosystem may be applied to banking, he adds, which is also positive. As per Lubin’s sources, Ethereum now has 48M registered unique users. Besides, 12K new nodes have been launched, which is a great potential for the decentralized network. Currently, when the crypto market is hitting its bottom when it comes to investor interest, the devs are busy creating new technologies that could be used in real life. Once the market is ready, this will be great for ETH to attract new investors and ‘re-animate’ the existing ones. Meanwhile, the amount of ETH on the investors’ wallets is rising heavily, having increased by now by 80%. The accounts with most crypto money are called ‘whales’, and they currently have 20% of all Ether coins, i.e. around 20M, while in early 2017 it was just about 5M. It is possible the investors are going into ETH because of the market fall, as most altcoins are traded against ETH. The number of ‘whales’, meanwhile, has gone slightly down.